Development squad manager Barry Nicholson has stepped up to the plate to take on the mantle of first-team coach at Fleetwood Town after assistant boss Chris Lucketti’s shock exit. 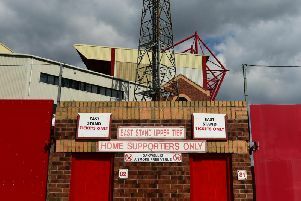 When Graham Alexander was sacked in September 2015, Lucketti and the rest of his backroom team all stayed at Highbury to work under new manager Steven Pressley. But Lucketti made the shock decision to leave the club just before pre-season commenced on Wednesday to team up again with ex-Preston team-mate Alexander at Town’s League One rivals Scunthorpe. Now Pressley says that continuity is key and that newly promoted Nicholson, fitness coach Youl Mawene and goalkeeping coach David Lucas are all staying put and will all have to “muck in” as the club prepares for the big kick-off at Northampton on August 6. Scot Pressley, who brought in his own assistant in Neil MacFarlane to work alongside Lucketti, says he understands why the ex-North Ender has opted to reunite with Alexander, who took his first job since leaving Highbury with the Iron in March. The Town boss said: “When I came in, I was keen to keep the continuity going. There was a good relationship between all the staff and it is a real disappointment to lose Chris, but there was a touch of inevitability about it. “I work very closely with my own assistant Neil MacFarlane. Chris has been very close with Graham and so I understand his reasons. And Pressley says his ex-Scotland team-mate Nicholson will have a dual role of helping development squad players graduate to the first team. He added: “Barry is going to step up as first-team coach. He will also have a role bridging the gap between the development squad and the first team, allowing a smooth transition between the two. “Barry’s move up will be good for the club. I’m a big believer in continuity. “At times change is required but Chris going makes the change more seamless. And with pre-season training under way, Pressley says the club will be on the hunt for a new development squad coach. He said: “Nathan Rooney will be working between the U18 squad and the development squad, and Barry will be working between the development group and the first team until we get a development coach in. Alexander said the wheels were put in motion to bring Lucketti to Scunthorpe at the end of last season. He said: “We know each other very well and how we work. He knows what I expect from the players. Chris will be nothing but good for them and the staff. Lucketti replaces Nick Daws, who becomes first-team coach, as assistant manager. Young defender Tyler Forbes has not reported in with the rest of the Fleetwood squad for pre-season training this week, The Gazette understands. Forbes was offered a new deal this summer but it is unclear whether the 20-year-old full-back has accepted. He made 21 Town appearances last season, scoring twice, and 17 in 2014-15.